Wat Ounalom and the Riverfront area In Phnom Penh, Cambodia. 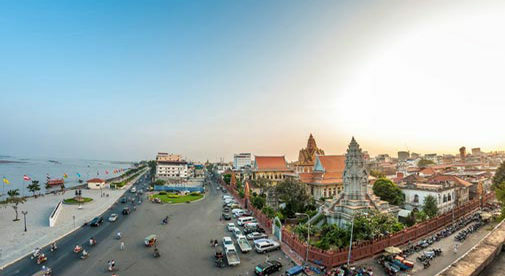 Cambodia is one of the few countries in Southeast Asia that has been making it simpler for foreigners to buy property. In 2010 Cambodia passed the Foreign Ownership Property law; this allows foreigners to purchase up to 70% of the units above the ground floor in apartment buildings. Overnight the country became one of the easiest places for a foreigner to invest in Asian property. This quickly caught the eye of international developers, who began launching large projects aimed at overseas buyers. These buyers were mostly Chinese looking to diversify into real estate, but there are also buyers from Singapore and Hong Kong, where property prices are sky high. Now there are signs of an oversupply. Even the most casual observer can’t help but think of the old saying, “too much, too soon,” as they read in the newspaper of another stalled project or notice the absence of lights as they drive by a new apartment building at night. While off-plan buyers are taking the easier but ultimately riskier route, some savvy expats have found a way to double their money by renovating and selling older apartments in select locations. Know which neighborhoods to target and how to buy—and also how to renovate these properties—and you could also make an attractive rental return…upwards of 15% gross. Wade Olson has been investing this way in Phnom Penh for more than four years. “I saw there were lower costs of entry and more potential upside to buying up existing apartments and renovating them to a Western standard, which really complements some of the more unique, older-style buildings in Phnom Penh,” he says. “My first investment was in a two-bedroom apartment in central Phnom Penh, only a few hundred meters from the popular riverside tourist area. I bought it for $98,980, then spent around $20,000 fixing it up, redecorating, and furnishing it to be more appealing to Westerners. “Though I received offers of over $148,470 for the apartment, I decided to put it on the rental market for tourists and expats looking for one- to three-month rentals,” says Wade. Wade has gone on to purchase and renovate four more apartments. He has sold two of these for a proﬁt and the remaining units he rents out for an average 10% to 20% gross yield. “All of my property renovations have been profitable except for one, which went off the rails when I started doing stuff because I liked it rather than sticking to my budget. That was a good learning experience, and the lesson was never let a project get too personal. If you’re looking to invest in a ﬁxer-upper in Phnom Penh, then the best neighborhoods to target are the Central Business District (CBD) or the Riverside. Both are in and around the Daun Penh district at the center of the city, which has a plentiful supply of older properties available for sale at reasonably low prices. The CBD is the hottest place for big business and is where the city’s tallest skyscrapers, including the 39-story Vattanac Tower and the 32-story Canadia Tower, are located. These are home to a growing number of local and international companies. This makes this area perfect for prentals targeting the expat professionals who work for these companies. Riverside is the epicenter for tourists visiting Phnom Penh as it’s close to landmarks like the Royal Palace and Wat Phnom temple, as well as to iconic buildings from the French colonial period, such as the Central Market. International foreign arrivals to Cambodia have grown from 1.7 million in 2006 to over 5 million in 2016, and hotel occupancy hovers around 70% (according to the Ministry of Tourism). So you can see the upside to catering to short-term rentals in these popular central areas. When I looked for property I found you could buy a two-bedroom townhouse apartment a stone’s throw from Riverside in need of renovation for $69,128. It had one bathroom, a balcony, and a mezzanine. I came across a similar property nearby that’s been thoroughly ﬁxed up and decorated to a high Western standard selling for $224,533. I also found a similar apartment for rent at $595 a month, long term. Airbnb listings in the same neighborhood for the same type of property list for $69 a night. With a 50% occupancy rate, such a property could generate $1,035 a month. For the fixer-upper play you’ll be investing in properties that were built before 2010, so you will be looking at buying something with “soft” title (which accounts for most property titles in Cambodia). What this means is that you will need to set up a properly structured local company for buying property. This is relatively simple to do. It allows you to own 49% of the company shares, with the remainder split among three Cambodian nominees. To ensure you retain control of the board of directors, these shares have different voting rights, leaving you as the only decision maker. Additionally, it is possible to arrange lease agreements with local banks that finance the property title in your name and can only release to you as the owner. Finding low-cost labor in Cambodia is easy, but the country is well known to suffer from a skills shortage in many sectors, including construction. Skilled tradesmen who can work to the Western standards needed for these sorts of renovation projects are hard to come by. So expats like Wade are often hands-on with the renovation work. A great trick that many expat property flippers have been profiting from is to add more space. This works especially well in properties with high ceilings, where adding extra storage or even a split-floor bedroom can significantly boost a property’s asking price. Finding a good-value renovation property in Phnom Penh is all about casting a net as wide as possible to find sellers who are motivated. You should use every source of information you can find to uncover the best deals on the market. Checking online property listings is a good way to get an overview of what’s available, but it’s more important to build a network of reliable contacts and agents who can supply you with decent leads. Many sellers use multiple agents to find buyers in Phnom Penh, and you should adopt the same strategy.